Kathy Kelly co-coordinates Voices for Creative Nonviolence, an antiwar activist campaign. Dan and I are among 25 defendants charged with obstructing a Minneapolis Metro transit vehicle on April 11, the opening day of the Minnesota Twins baseball season. The Legal Rights Center lawyers working with us arranged a calendar so that small groups would be tried weekly. Earlier this month, two people were acquitted of all charges and one person was convicted. Two days ago, Andrew Gordon and Priyanka Premo, lawyers from the Minneapolis Legal Rights Center who represented Dan and me, began the jury selection process. Yesterday, evidence was presented and the jury was asked to determine a verdict. The jury didn't arrive at a verdict last night. We felt grateful they did not rush to judgement on what many would see as a cut and dry case. The prosecution presented, as evidence, a photo of me standing, arms linked with others, in front of a bus. Before the April 11 action, Black Lives Matter activists facilitated a retreat for about 100 Midwesterners who gather, annually, for a "Faith and Resistance" retreat. The retreats invite communities that operate Catholic Worker houses of hospitality, along with other companions, to gather for education, reflection and action. The communities try to live simply, share resources more radically and prefer service to dominance. They also promote nonviolent resistance to injustice. 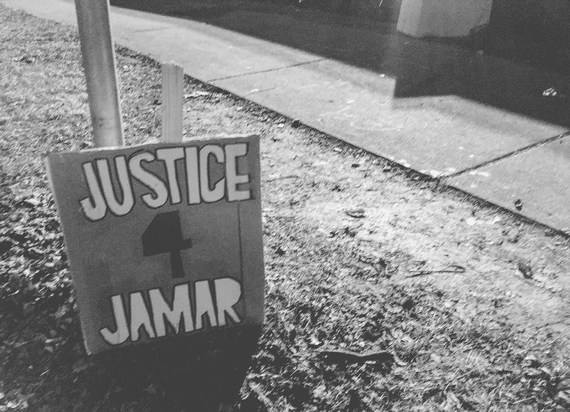 During the retreat, we learned more about Jamar Clark's execution and the many protest actions already organized by Black Lives Matter activists. In Chicago, I knew of an earlier execution that took place five miles from where I was raised. On October 20, 2014, a police officer, Jason Van Dyke, pumped 16 bullets into Laquan McDonald's body after he had already fallen to the ground. Laquan's executioner was initially held without bail for one month. Officer Van Dyke was released on November 30th, 2014. My court proceeding was exceedingly polite and well-mannered, like a game of "Mother May I" on steroids as lawyers preceded every action they took with an address to Judge Shereen Askalani: Your Honor, may I publish Exhibit #1 (hand it to the jurors). Your Honor, may I step to the side so I can view the video? Scripted, choreographed, utterly careful. In my mind's eye, I kept seeing videos of people of color, like Laquan McDonald and Jamar Clark, dying in pools of their own blood. 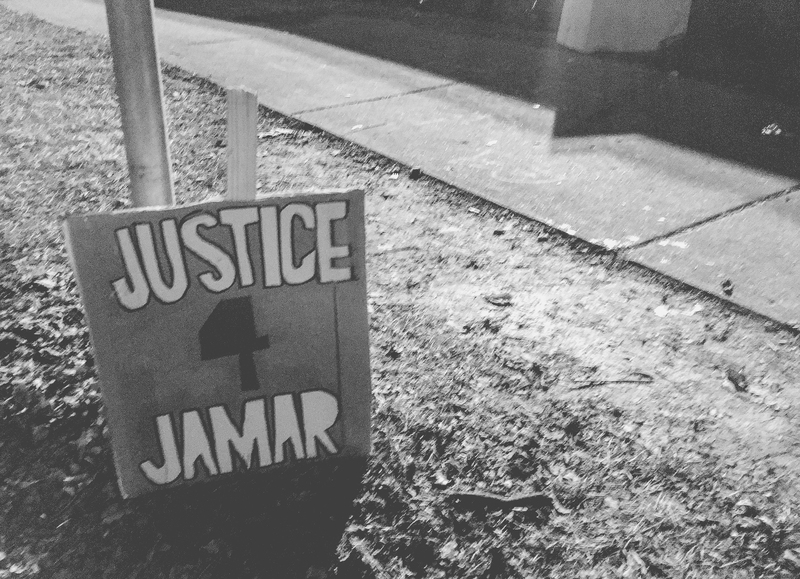 The prosecutor insisted that any mention of the signs we had on April 11, signs that read "White Silence Equals Violence" and "Justice for Jamar," could inflame the passions of the jury. Judge Askalani instructed our lawyers not to mention, in opening remarks, anything that would reveal our intentions for protesting. It's odd. In court, witnesses promise to "tell the whole truth and nothing but the truth" but then proceed to disclose only a tiny sliver of the truth in order to comply with the Court's myriad instructions. There was barely a mention of Jamar Clark, or of police executions. There was no discussion of the systemic racism that afflicts people in every community where people of color are executed with no questions asked. The police officers become the judge, jury and executioner. It reminds me of targeted assassinations conducted through drone warfare. I wasn't sure, this morning, if a jury of our peers would judge Dan and me criminals. I am quite sure that I didn't travel to Minneapolis with the intent of blocking a Metro Transit bus. I came in response to an unjust execution. I couldn't find myself standing idly by, as though mesmerized, while these executions continue. Does anyone favor unjust executions? If we don't favor them, how do we plan to stop them? Although found guilty, I'll still act in accordance with my belief that we didn't act criminally. And, truthfully, we can never be acquitted of our responsibility to continue breaking the terrible silence surrounding unjust executions that afflict people of color in the U.S.